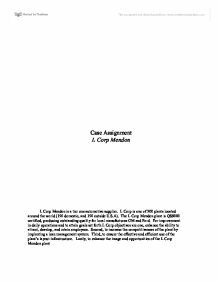 Case Assignment L Corp Mendon L Corp Mendon is a tier one automotive supplier. L Corp is one of 300 plants located around the world (150 domestic, and 150 outside U.S.A). The L Corp Mendon plant is QS9000 certified, producing outstanding quality for local manufactures GM and Ford. For improvement in daily operations and to attain goals set forth L Corp objectives are one, enhance the ability to attract, develop, and retain employees. Second, to increase the competitiveness of the plant by implanting a lean management system. Third, to ensure the effective and efficient use of the plant's layout infrastructure. 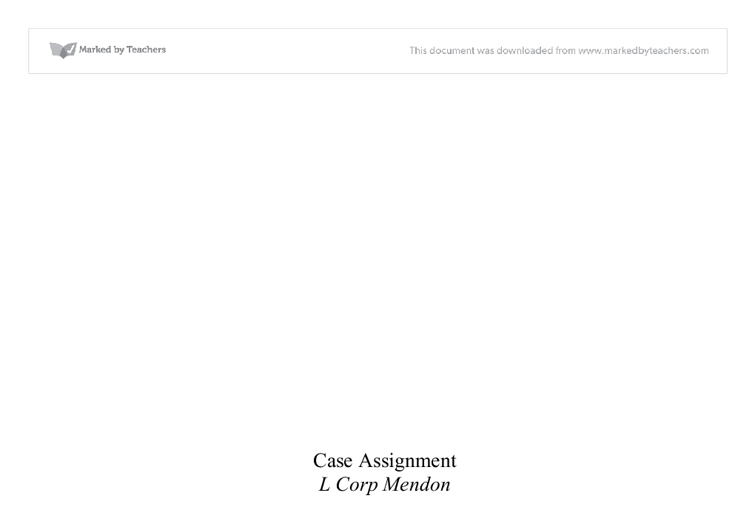 Lastly, to enhance the image and opportunities of the L Corp Mendon plant Problems known to the L Corp Mendon plant include are overall sales at Mendon plant have decreased, specifically a lost of business from GM. Mendon plant saw a decrease in the number of individuals employed, translating to the ineffectiveness of the plant to attract and attain employees. Of those 470 employees retained the morale is among them is low. Problems with the plants layout include a complex process flow, floor space utilization, and poor lighting Lead times at Mendon are longer then desired and there is a lack of lean management implementation. ...read more. The increase of morale will be a natural progression as we make improvements to the Mendon plant overall. With the problem of bad lighting increase lighting, use correct watts to increase energy savings. Invest money into repairs and remodeling the facility in order to make process flow run smoothly and efficiently. In reference to the waste with regards to inventory we recommend pull system, and smaller lot sizes. Due to the high inventory, we should leave enough room to store the inventory. As a characteristic of good layout, it must provide for an efficient flow of workers and materials (N, Wu. 2006). We will locate the mold storage to be closer to production/operation area. To minimize the traveling and walking, we will move one of the tool rooms to the east, which is near the maintenance service machine shop. To make the officer get the materials more easily, we will exchange the printing room with the storage under the main office. Lastly, we want to move the R&D, which should be near the main office. We will exchange the R&D with the storage above the production press area The storage and warehouse layout must address the principles of slotting, zoning, space sizing, vertical product, picking, and five S implementation. ...read more. With such a system, accuracy and efficiency will significantly increase across the entire plant. Raw materials will now be quickly located and retrieved resulting in less time waste previously associated with beginning a new process. Sales and shipping times will benefit from a superior system that allows for the quick location and transport of finished products, and it will be a much easier task for the management team to analyze current inventories on hand and plan far more efficiently for future production leading to lower inventory and production costs. The $100,000 budget that the Mendon plant has to use on facility improvements should be allocated as follows: * $25,000 for changes and reallocation of the Plant Layout * $10,000 for cosmetic maintenance to promote modernization * $10,000 for the implement of a cataloging system * $45,000 for purchase of additional production equipment $10,000 for inventory and storage transportation equipment In conclusion changes in the plant layout alone will increase productivity and result in a reduction of lead time due to the elimination of wastes from excess movement around the plant during the manufacturing process. Our group has determined the necessary improvements that the Mendon plant must make are with the plant layout, implementation of a cataloging system, and renovation of current facilities in order to increase production, efficiency, and morale while reducing cost and waste. ...read more. (Microsoft have customers who have signed up to email subscription of products and updates). ICT also makes it easier to take payments from customers who are paying over the internet, via credit-card, etc. In addition to this ICT is also helpful to businesses because they can collect feedback from customers over the internet. a significant influence and control on their part of organization to shape its future direction. Trusts must develop new forms of leadership which are centered on improved techniques to communicate, recognize achievement, support training and develop good financial focus across the entire workforce. affected by the recession is because they are products are cheap convenience foods. This means that people may be more inclined to buy Ginsters products in a recession rather than for example eating out Ginsters pasties may a treat for people in the recession rather than having a meal out. * Skimming involves charging a high price for a new product for a limited time. The aim is to gain as much profit as possible for a new product while demand is high and it is unique. London won the chance of hosting this event with in the competition with many other countries. This thesis will discover the ways and guidelines for the London Olympics committee in order to learn and study the achievements as well as the failures from the previous Olympic Games hosting countries.